The books in the Donaldson Collection, which was bequeathed to the Library by Principal Sir James Donaldson in 1915, have finally been fully classified to the Library of Congress scheme after 104 years, and are soon to be fully catalogued by the Lighting the Past team. All that remains are a few periodicals, which the team will tackle later this year, putting into practice their newly developed skills in this area of cataloguing. In completing the classification by subject, we unearthed some interesting and unusual items, which were previously only identified by Donaldson’s own idiosyncratic shelf marks. His book collecting was diverse, including both books that were rare and unusual in his era, as well as his working library on religion, classics, language, and education, among other topics. The collection now serves as a window into the world of a turn-of-the-20th century academic and educator. Below are a few interesting discoveries in the newly classified section of the Donaldson Collection. 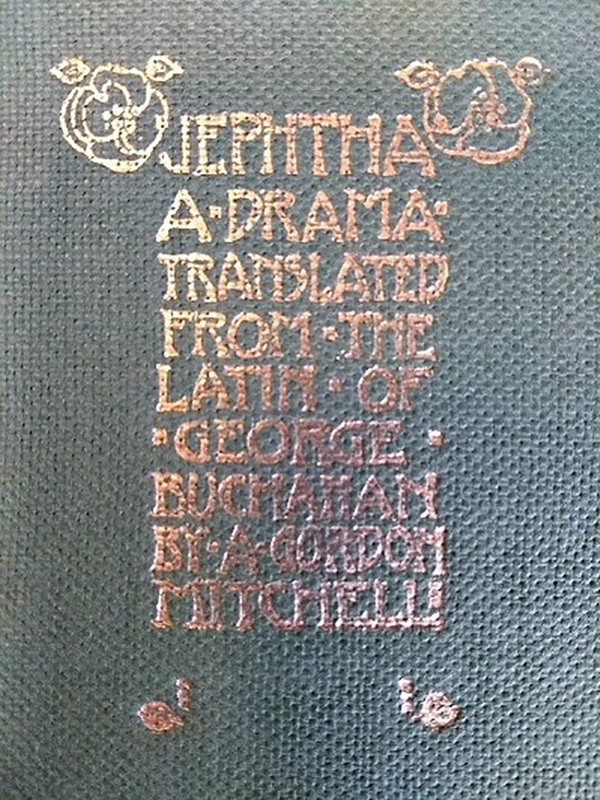 First published in 1554 in Latin, George Buchanan’s Jephthes is a retelling of the story of Jephthah, an Old Testament figure who inadvertently vowed to sacrifice his daughter to God. 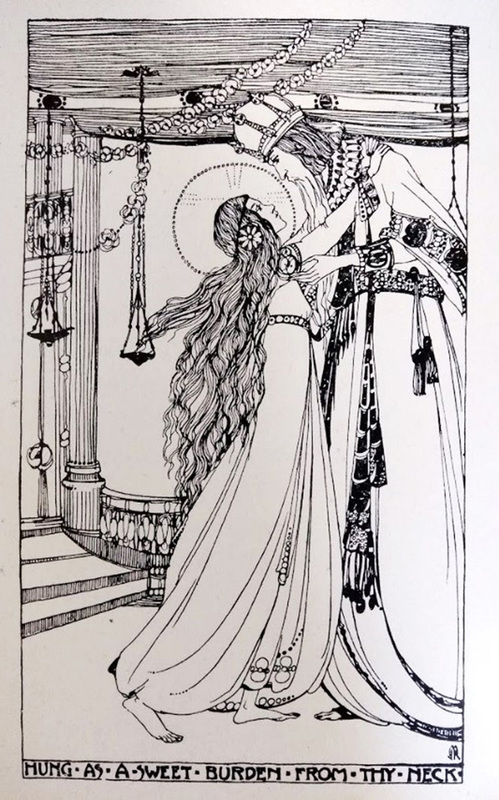 This 1902 English translation of the drama is accompanied by beautiful illustrations by Jessie M. King. 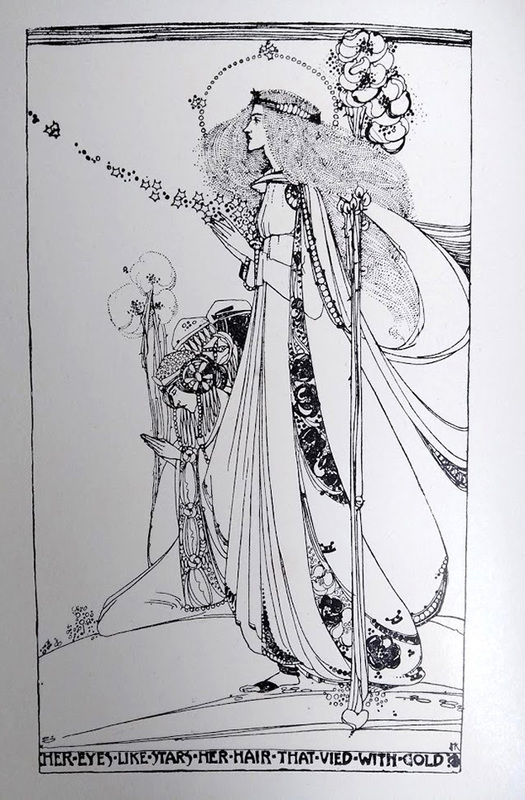 King, one of the artists known as the ‘Glasgow Girls’, was a graduate of the Glasgow School of Art and a major participant in the Art Nouveau movement alongside the likes of Charles Rennie Mackintosh. Mitchell received the honorary degree of Doctor of Divinity from the University of St Andrews in 1906, during the celebrations to mark the 400th anniversary of the birth of George Buchanan. Perhaps he gifted this book to Principal Donaldson during the festivities? There is no inscription in the book itself, but the possibility is tantalizing. 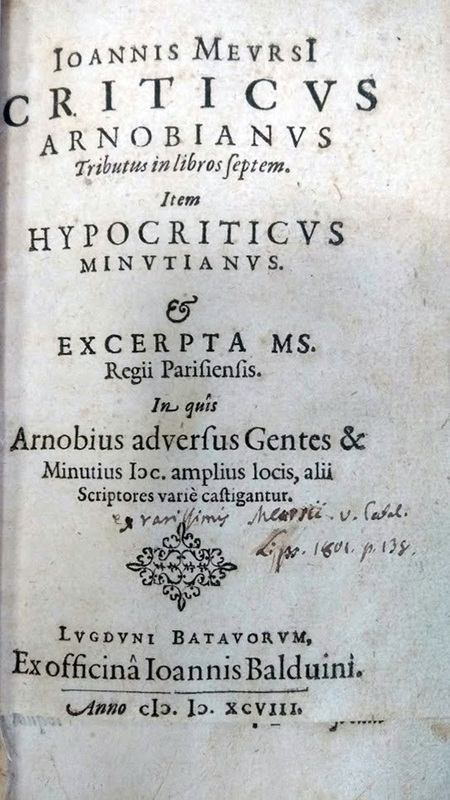 A much older discovery was a book from the end of the 16th century, which appeared unassuming on the shelf but surprised the cataloguing team with its publication date, written in apostrophic characters, representing 1598. The author, Johannes van Meurs (1579-1639) would have only been 19 when this book was published! Perhaps, as an educator, Donaldson found this precocious Dutch teenager to be an interesting study. This work is on Arnobius of Sicca, an early Christian philosopher. The title page of this book contains some provenance information partially through its lack of a bottom edge. At some point, the paper beneath the date was cut from the book, perhaps because it contained an ownership inscription. Surviving, however, is a short manuscript note in ink referring to a page in another work. Regardless of where it was before reaching Donaldson’s hands, he seems to have had the book rebound after purchasing it, as is evidenced by its similarity to many of the other books in his collection, and the binders’ label on the inside of the back board. The Lighting the Past cataloguer who picked up this book for processing was thrilled to catalogue her first 16th century book. It is now catalogued to Phase 1 specifications. In addition to his interest in historical and theological works, Principal Donaldson also appears to have been a well-travelled and thorough man, as evidenced by his collections of guidebooks from locations throughout the United Kingdom, continental Europe, and some more far-flung locations such as Egypt and Australia. He seems to have had a preference for the restorative powers of water, with many pamphlets extolling the virtues of lake and seaside communities alongside advertisements for ‘spa’ towns. 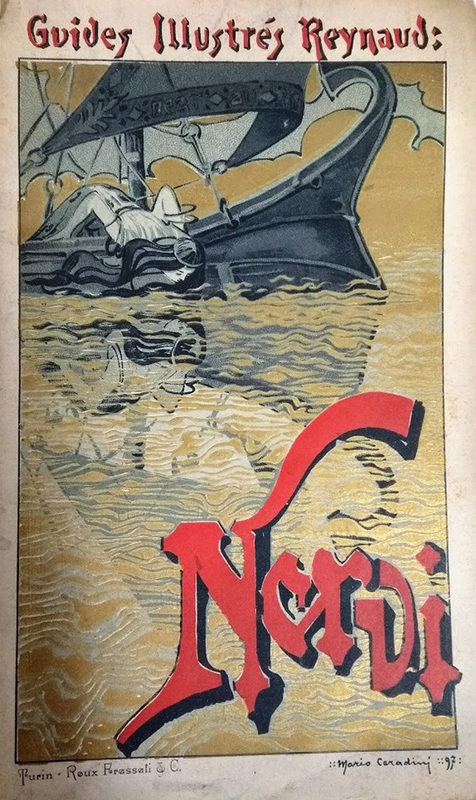 This lovely item is a French-language guidebook to the Italian coastal village of Nervi. The cover romantically reflects the sea-going heritage of the community through an illustration of a young woman peering at herself through golden waves. 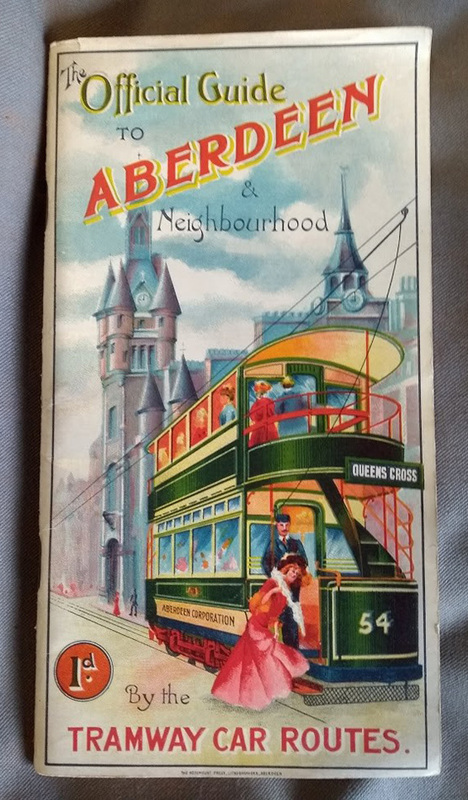 Closer to home is this surprisingly bright-looking guide to the Aberdeen tramway, with a well-dressed woman catching the double-decker vehicle in front of the Town House on Union Street. Trams appeared in Aberdeen in 1898 and continued to run through to the 1950s, earning the system the illustrious title of ‘the northernmost municipal tramway in the United Kingdom’. 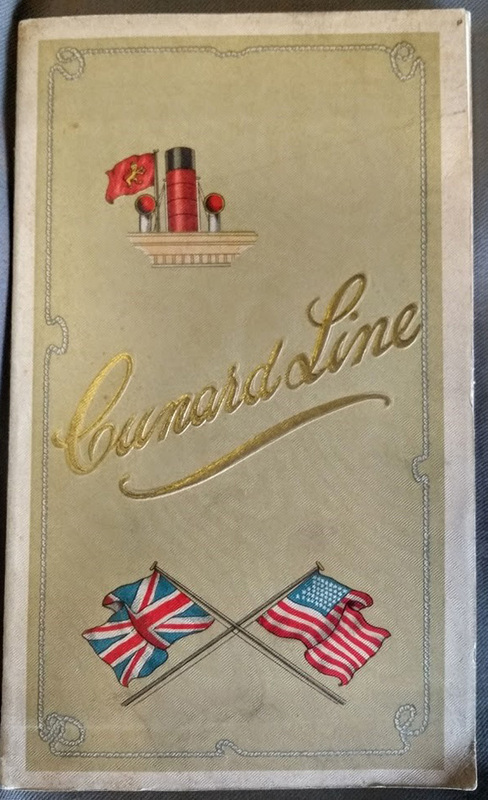 Transatlantic voyages are also represented by this brochure for the Cunard Line, which dates from about 1904-5. It highlights the amenities available on the Cunard fleet, which would soon launch the Lusitania; a ship now infamous for its sinking in 1915 by a German U-Boat. The jaunty tone of the text promises only a speedy and fashionable trip across the North Atlantic, and makes suggestions on what to wear (something warm), when to promenade on the decks (whenever sandwiches are served), and how many cases to bring to your stateroom (as few as possible, the trip to New York being casual so you shouldn’t need too much eveningwear). As the Lighting the Past team catalogued the Donaldson Collection, we noticed how much of a ‘feel’ for the former owner we got as we spent full days among his books, considering classification and subjects, and noticing where his interests seemed strongest. Such is the joy of a comprehensive, donated collection with a single owner – the books themselves are not the only treasure; the collection speaks volumes. P.S. Donaldson is also represented in Special Collections holdings through his archive as Principal and Personal papers, which include extensive correspondence. The archival material is yet to be fully catalogued to modern standards.